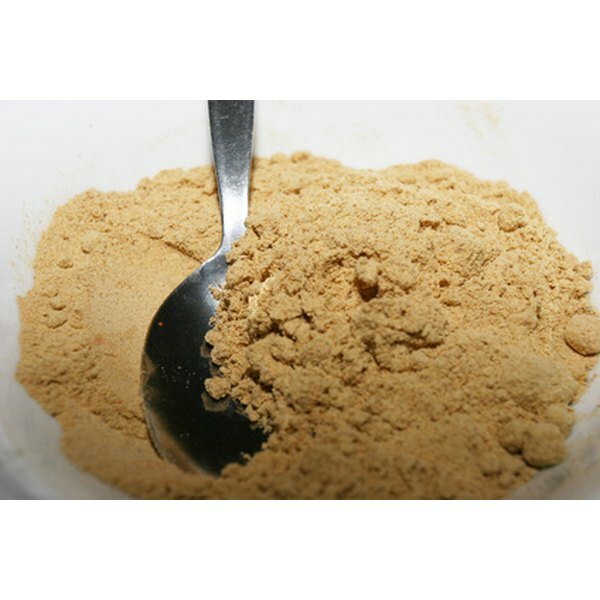 Wild yam powder is available in many health food and supplement stores. It is sold under a variety of names, including wild Mexican yam, colic root, rheumatism root and Chinese yam. Since the substance is not FDA-regulated, it’s important to consult a health care provider prior to using it. When taken in large doses, wild yam can cause vomiting, nausea and diarrhea, according to the American Cancer Society. However, when taken properly, wild yam powder has a number of benefits. Wild yams contain a high concentration of antioxidants, according to a November 2004 article that appeared in "Food Chemistry." Antioxidants attack free radicals in the body and are therefore beneficial at preventing a number of diseases, including cancer and cardiovascular disorders. Wild yam powder is commonly used to treat numerous digestive issues, including irritable bowel syndrome (IBS). This is because wild yam contains alkaloids, which help relax muscles in the stomach, according to SixWise.com. Some manufacturers recommend the powder as a way to relieve morning sickness during pregnancy. However, the American Cancer Society states that it is not recommended for women who are pregnant or breastfeeding due to a lack of safety information. According to the University of Maryland Medical Center, many researchers believe that wild yam can help lower cholesterol. Wild yam contains diosgenin, which blocked the body from absorbing cholesterol in animal studies. Further research is needed to validate this claim in humans. Anyone suffering from high cholesterol should talk to a health care provider before taking wild yam powder. Thinning hair and hair loss is a problem for many women as they age. To combat this, NaturalNews.com recommends combining wild yam, dong quai and chaste berry. This method should not be used if hair loss is the result of another condition, such as cancer treatment. Consult an herbalist and talk to a health care provider about possible side effects and specific dosing information.